"Saint Patrick Beneath the Rock of Cashel"
The inspiration for this panel comes from living within a short distance from the famous and historic Rock of Cashel in Ireland. It was in 2006, with Saint Patrick's Day approaching, that I got to work on a design with both the Rock and Saint Patrick. It was to be my first design using our new Glass Eye 2000 Enterprise Edition. In addition to Enterprise we had also purchased a CADRAM resin dispensing machine, and thus had everything we needed to create faux stained glass panels. I was eager to put these purchases to work on my new design. I had already made a design of the Rock using the edition of Glass Eye 2000 I had before upgrading to Enterprise. I resized that design and then pasted it into the background of my new one. The Rock stands above the town of Cashel, about ¾ of a mile away, and by using the Stretch command I was easily able to get the proportions just right. To draw Saint Patrick's hands, we took photographs of Tom's hands and imported them into Glass Eye 2000. Although the AutoTrace command is generally recommended for line drawings, not photographs, we used it to get a start. We then did some fine tuning of our own and the result was very realistic. To accompany Saint Patrick I included several Irish symbols. The harp has been a symbol of Ireland for centuries and appears on all our coins and official documents. The shamrock is another. We were taught in school that Saint Patrick used it to explain The Holy Trinity: The Father, the Son and the Holy Ghost. It grows wild in our country and we wear it on Saint Patrick's Day. Creating shamrocks was easy as we grew up drawing them! After drawing one I could use the Copy and Paste commands to create as many as I liked. A snake is shown because legend has it that Saint Patrick banished all the snakes from our fair land, although in truth Ireland never had snakes at all! I added daffodils because they are always in bloom on Saint Patrick's Day. Every March daffodils are sold throughout Ireland to raise funds for cancer research. Finally, I incorporated the green, white and orange of our national flag. Once the design was complete, we used the Plot command in Enterprise to produce black resin lines with a thickness of 3.2mm. For the colour itself we use a sandblast colour kit consisting of Part A infill and Part B infill, mixing the two together and then adding any of ten pigments. The result is transparent, giving you a faux glass effect; by adding white we can increase the opacity. It is a strong cellulous-based liquid and we always wear masks and exercise caution when working with it. We use pipettes to colour as we can draw colour in to them and slowly release it between the resin lines. On the wall surrounding the Rock, we used white as our base colour and dragged a pipette containing black to give the effect of stone. Mixing colours for skin tone requires white, yellow and just a drop of red. After 24 hours of drying time our piece was ready to be placed within an oak door frame measuring 80" x 32". It stands in our showroom and is always a topic of conversion. We have to say that without Glass Eye 2000 Enterprise Edition we would be lost. We use no other software for drawing or plotting. The design possibilities with Glass Eye 2000 are endless, and the ability to resize, combine, and plot is a lifesaver. This year on March 15, Cashel will host the annual Skyfest fireworks show, the largest in Ireland. 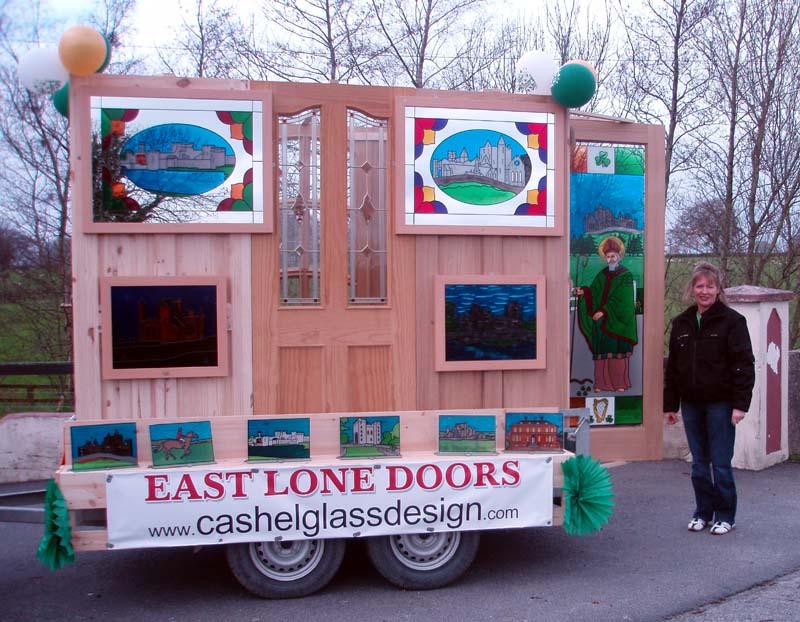 The annual Saint Patrick's Day parade will run earlier in the day, and our panel of Saint Patrick Beneath the Rock of Cashel will be on one of the floats! The Gaysons are a husband and wife team that started their cabinetry and glass business in 2001. Initially they purchased stained glass panels from a third party, which limited their creativity. Looking to expand into new areas, they contacted RegaLead in England. RegaLead managing director David Rabone recommended upgrading to Glass Eye 2000 Enterprise Edition. Now Anne and Tom work together designing and creating beveled and leaded glass door panels, as well as faux designs for mirrors and doors. You can see their work on their website, and you may contact them by email.